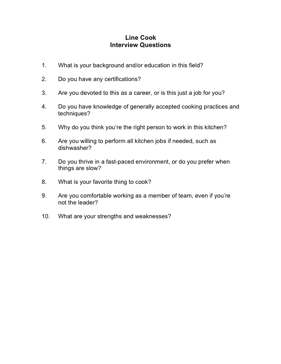 Choose your next Line Cook with the aid of these helpful interview questions. 4. Do you have knowledge of generally accepted cooking practices and techniques? 5. Why do you think you're the right person to work in this kitchen? 6. Are you willing to perform all kitchen jobs if needed, such as dishwasher? 8. What is your favorite thing to cook? 9. Are you comfortable working as a member of team, even if you're not the leader?